Joyce Staudenmaier, 36, was shot once in the chest when it appeared she was about to stab another resident, a sheriff’s spokesman said. 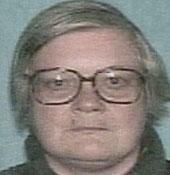 Staudenmaier was alive when she was transported to Oregon Health & Science University Hospital. But she died later Friday afternoon. Sgt. Paul Steigleder II, who has about 20 years experience with the Clackamas County Sheriff’s Office, is on paid administrative leave following the shooting, said Deputy Joel Manley. Steigleder is a 41-year-old supervisor who is “well respected by his supervisors, peers, subordinates and by the community he serves,” Manley said. The scene of the shooting at Chez Ami housing project in Clackamas County. The sergeant was summoned to the Chez Ami housing complex on 8358 SE Causey St. in Clackamas County to help mental health staff take Staudenmire into custody for an evaluation about 10 a.m. on Friday, according to Manley. Authorities were called to Chez Ami because Staudenmaier was known to carry a weapon in her purse, Manley said. When Steigleder arrived at Chez Ami, Staudenmaier wasn’t home. At some point, Staudenmaier came back to the building where she lived and began threatening about five residents in the lobby with a knife. The sergeant saw Staudenmaier and went into the lobby. Staudenmaier saw the sergeant and began walking towards him with the knife raised, Manley said. But between she and the sergeant was another resident. “She was holding the knife above her head” and looked as if she was going to stab the resident, Manley said. That’s when the sergeant made the decision to fire one shot from his service pistol, he said. Witnesses also said Staudenmaier was so close to the sergeant that they thought that he was stabbed. The Clackamas County Sheriff’s Office is continuing to investigate the officer-involved shooting. A Clackamas County sheriff’s sergeant on Friday shot and killed a mentally ill woman with a history of violent behavior after she lunged at him and another person with a knife, police said. Joyce M. Staudenmaier, 49, died during surgery for a single gunshot wound to the chest. The sheriff’s office declined to identify the sergeant who shot her, saying only that he is a well-respected supervisor who has been with the department for years. The sergeant was placed on paid administrative leave pending the investigation of the shooting. Staudenmaier lived at Chez Ami Apartments, a 40-unit housing complex for people with mental illnesses just north of Clackamas Town Center. The building is owned and managed by Central City Concern, a Portland-based nonprofit affordable housing group. Residents receive counseling and support from Clackamas County Mental Health Division staff, but they live independently and are free to come and go. The shooting occurred at 10:29 a.m. Shortly after 10 a.m., Clackamas County Mental Health Division workers called authorities for assistance with Staudenmaier, who had been deteriorating in recent days but was not in the building at the time of the call. Mental health workers wanted to place Staudenmaier on a “mental hold,” and the sergeant responding to the call was informed that Staudenmaier had a history of violent behavior and likely carried a weapon. The sheriff’s sergeant was dispatched at 10:11 a.m. A short time later, he arrived alone at the apartment building and entered the first-floor lobby. After learning more about Staudenmaier’s history of violence, the sergeant called for a backup deputy. Before the backup arrived, Staudenmaier returned to the building and entered the lobby. She pulled a knife from her purse and lunged at the sergeant. She also threatened another person who was in the lobby. The sergeant tried to back away, but when he couldn’t escape, he shot Staudenmaier once in the chest. The shooting was at 10:29 a.m., 18 minutes after the sergeant was dispatched. Staudenmaier was taken by ambulance to OHSU Hospital, where she died. The sergeant did not use any less-lethal forms of force. “The sergeant felt his life was threatened,” sheriff’s Deputy Joel Manley said. Residents of the complex said that they heard a man yell, “Put it down. Put it down. Put it down,” followed by a single gunshot. A resident who asked not to be identified said she was awakened by the shooting and left her apartment to see Staudenmaier lying on the ground on the first floor with her head on the bottom stair. Richard Henderson, a friend of Staudenmaier’s family, described Staudenmaier as an intelligent woman who had experienced mental health problems since her early 20s and was receiving care from a psychiatrist. Henderson said he couldn’t imagine that shooting was called for, even if she did have an outburst. Before Friday’s shooting, police had visited Staudenmaier’s apartment at Chez Ami twice. In November 2002, she locked herself in her room and refused to take her medication. The next incident was Nov. 30, 2003, after she told people she planned to commit suicide on her birthday, the next day. When police contacted her, however, she said she didn’t want to hurt herself. Residents described Staudenmaier as behaving oddly in recent days. More than one resident reported seeing Staudenmaier walking around the building in a bathrobe, talking to herself. Tim and Kathy Shaw, whose 29-year-old son, Taylor, moved into the building about six months ago, said their son told them Staudenmaier rang the buzzers for all the residents’ apartments Thursday morning because she had run out of cigarettes. Kris Shaner, who has lived in the building for about a year and a half and is diagnosed with a variety of mental illnesses, said that last year that Staudenmaier started talking more openly and angrily to voices she was hearing. “She’s scary when she yells. She’s a big woman,” Shaner said. In September 2000, Staudenmaier had a violent outburst at the Danielsons Fresh Marketplace in Oregon City. According to police reports, Staudenmaier was approached by an employee and accused of shoplifting. Staudenmaier hit the employee, then threatened her with a knife and was arrested, police reports said. A large kitchen knife was found in her backpack. Staudenmaier was diverted to a special mental health court program, where she underwent mental health treatment, made monthly appearances before a judge and was monitored more carefully than with traditional probation. Friday’s request for a mental hold followed procedure. Certain mental health officials have the authority to have a person hospitalized on a mental hold if a person’s illness becomes acute, said Susan Johnson, housing coordinator for the Clackamas County Mental Health Division. They are taken into custody and admitted to a psychiatric hospital, even if they refuse treatment. The circumstances of Friday’s shootings had similarities to a 2003 shooting involving Clackamas County Sheriff’s Sgt. Damon Coates, who was shot in the head after responding to a report of a 15-year-old with mental problems. The teenager, Nick Teixeira, shot Coates, and then another officer shot and wounded Teixeira. Coates, who suffered a debilitating brain injury, later sued the county, saying dispatchers should have done more to let him know that Teixeira was armed. The lawsuit also alleged that the deputies who responded to the call before Coates were not trained in how to respond to a situation involving a mentally ill person. The last time Jacquelyn Staudenmaier saw her older sister, Joyce, a couple of weeks ago, they had lunch at Carl’s Jr. Joyce insisted on paying because Jacquelyn had just bought a house. Joyce brought a housewarming present: a box containing hand lotion, a candle, cigarettes and a lottery ticket. That day was like many Jacquelyn had spent with Joyce, who had battled schizophrenia for nearly 30 years. “She had called me and asked if we could ‘go out to lunch and do something fun,'” Jacquelyn, 44, recalled Saturday night at her Beaverton home. “At first, she was upbeat. She sounded awesome. Then, it was click, the next minute she had me wondering what I did to upset her. The next time Jacquelyn heard about her sister was on the 12 o’clock news Friday, after a Clackamas County sheriff’s sergeant had shot and killed her. The sheriff’s office said Staudenmaier, 49, lunged at him and another person with a knife. The shooting, which took place at the apartment complex where Joyce lived just north of Clackamas Town Center, is under investigation. The sheriff’s office says it will release the name of the sergeant today. The sergeant, whom sheriff’s officials described as a well-respected supervisor who has been with the department for years, was placed on paid administrative leave pending the investigation. For the past two days, Jacquelyn and her older sister, Janice Burdick, 57, who traveled from Santa Cruz, Calif., after she heard the news, have been replaying Joyce’s tumultuous life in their heads. They remember her sharp intellect, her unfailing ability to send every family member a birthday card, her beautiful singing voice — and her longtime battle with the voices inside her head. Schizophrenia is a misunderstood illness, they say, and their sister was a misunderstood woman, right up until the end of her life. The Staudenmaier sisters grew up in Lake Oswego and attended Catholic schools. Their father worked for the former White Stag clothing company, and their mother was an accountant. The sisters’ names all started with “J”: Janice, Joyce, Joanne and Jacquelyn. Joyce graduated from Lakeridge High School in the early ’70s and went to a performing arts college in San Diego. She was an accomplished singer and dancer who had dreams of performing onstage, Jacquelyn said. Joyce threw herself into her theater studies, working a job on the side to support herself. When she was about 21, she collapsed at work one day. Her parents went to pick her up and take her back to Lake Oswego. That’s when Joyce’s battle with schizophrenia officially began. She was under psychiatric care from her mid-20s and was admitted to mental hospitals a couple of times. She never talked about it with Janice or Jacquelyn, but they knew. On the car ride back from San Diego, Jacquelyn, who was 16 at the time, says she could talk to her sister as she always did, but she knew Joyce had changed. Later Joanne Whalen, their sister, was diagnosed with schizophrenia. She is married and lives in upstate New York. Joyce continued trying to pursue her passion, enrolling in dance classes at Portland Community College. She injured her knee, which ended that dream. She enrolled in nursing school. But then the illness tightened its grip, and Joyce could never hold a steady job again. Her mother, Joan, took care of her, visiting every day and supporting her. Joyce often said her mom was her best friend, Jacquelyn said. When Joyce died, she was living at Chez Ami Apartments, a 40-unit housing complex for people with mental illnesses. The rest of her life went on, much like that last lunch Jacquelyn had with her. Often, she’d be warm and affectionate, sending gifts and cards. Other times, she wouldn’t return calls for weeks. Since Friday, Janice said she and her sister have been asking themselves what they could have done to prevent Joyce’s death. They’re reluctant to talk about the actions of law enforcement officials, but they say they are angry. The Clackamas County Sheriff’s Office identified the officer who shot a mentally ill woman to death Friday as Sgt. Paul Steigleder II, a supervisor who started with the sheriff’s office as a cadet 24 years ago. A sheriff’s spokesman said that following standard procedure, Steigleder will not be interviewed by investigators until after he meets with an attorney Tuesday. However, witnesses told investigators that Steigleder backed up and even ran from the woman before he reached a position where he could no longer retreat as she charged at him holding a knife above her head, said Joel Manley, the sheriff’s public information officer. The sheriff’s major crimes unit is investigating the shooting under the supervision of the district attorney and medical examiner. Detectives have interviewed other witnesses and have canvassed the area around the Chez Ami Apartments at 8358 Causey Ave., about a half-mile north of Clackamas Town Center, to find anyone with information. Sheriff Pat Detloff was not available for comment Sunday, Manley said. Investigators do not see a connection between Friday’s events and the wounding of Sgt. Damon Coates last year. Coates was surprised when a troubled 15-year-old he was handcuffing suddenly pulled a gun and shot him. In a lawsuit against the county, Coates, who suffers from permanent injuries, said dispatchers should have done more to make sure he knew the teen was armed and dangerous. He also contends that the deputies originally dispatched to the boy’s home were not trained to respond to a situation involving a mentally ill person. Steigleder was advised by dispatchers that Joyce M. Staudenmaier, 49, who lived with other mentally ill people in the apartment complex, was known to carry a knife at times. The sergeant went alone to the apartment complex operated by Central City Concern to help a mental health worker restrain Staudenmaier. After receiving a briefing in the complex office, he called for a second deputy. Before the deputy arrived, Staudenmaier, “obviously in crisis,” appeared while Steigleder was talking to people in the office and came at him with a knife, Manley said. Janice Burdick, Joyce Staudenmaier’s sister, was angry about the shooting. She said Saturday that her sister, who had a 30-year history of schizophrenia, should have been dealt with by someone who had experience with the mentally ill.
Staudenmaier’s family could not be reached for comment Sunday. Manley said that from what investigators were told, Staudenmaier was immediately violent. “This was not a situation where crisis training would apply,” Manley said. He said all Clackamas County deputies undergo crisis-intervention training, and as a supervisor, Steigleder had more extensive training. At one point, Manley said, Steigleder fell while trying to get away from Staudenmaier. “He hit an object — I don’t know if it was a wall — and he could not go any further” before shooting the woman in the chest. Staudenmaier died in surgery. Elaine Krause, co-president of the National Alliance for the Mentally Ill’s Clackamas County chapter, estimated that six years have passed since her organization last conducted crisis management training for Clackamas County sheriff’s deputies. She said representatives from the education and advocacy group talked to the incoming sheriff, Craig Roberts, about a month ago and asked to arrange more training. Krause said she is reserving judgment on whether Steigleder could have avoided shooting Staudenmaier. “Sure, it’s easy to say they should have handled it differently, and I wish they would have. But regardless, I wasn’t there,” she said. “People who are in a psychotic state, they feel trapped, perhaps very fearful, want to defend themselves, feel the whole world is after them,” Krause said. Manley said he had no information on whether Steigleder had been involved in past shootings. The Oregonian’s files show that the sergeant fired twice at a car in 1996 after, he said, the driver attempted to run him down after a traffic pursuit. The driver was not injured and was later arrested without incident. Steigleder, 41, who also supervised the sheriff’s marine unit, regularly patrolled the area that included the apartment for the mentally ill. He was described as respected within the sheriff’s office. He started as a cadet in 1980 and served until 1983, when he went to the Sitka, Alaska, police department. In February 1985, he returned to the Clackamas County Sheriff’s Office as a deputy and was promoted to sergeant three years later. In 1990, as a traffic team sergeant, he received a National Association of Counties Achievement Award for his work in breaking up teenage drinking parties as a way to reduce traffic deaths among young people. In 1992, he won a scholarship to take special training in juvenile crime and juvenile justice at the University of Southern California School of Public Administration. I work in a busy Portland emergency department that sees many psychiatric patients in crisis. I have often had to help restrain patients, and in one instance disarm a woman who had a knife. It can be a harrowing experience. Nevertheless, I find it hard to understand how an experienced sergeant could not find a way to use non-lethal force to defend himself against a 49-year-old schizophrenic woman with a knife. His adversary was not a well-conditioned martial-arts expert. People with severe mental illness are not particularly known for being in top shape. Where was the Mace, the baton, his fists and his feet? That he believed shooting this woman was his only option is a sad commentary on this sergeant’s training. That this woman had reached such a state of crisis is an indication of our failing safety net for mental health patients — but then, that’s another letter. Clackamas County was once my home and where I raised my children. I was a sergeant in the Clackamas County Sheriff’s Office until retiring in 2001. The shooting at Chez Ami Apartments last Friday was tragic. My heart goes out to the family and friends of Joyce Staudenmaier. For years they have loved her and have done everything possible to protect and guide her. Mental illness is such a confusing disease. I am without doubt that Staudenmaier saw Sgt. Paul Steigleder II as a horrible, evil threat that she had to protect herself from. And then she attacked that threat. No matter how much training you have, nothing prepares you for a violent response from a mentally ill person with a weapon. To take a person’s life is a nightmare for a police officer. It is the dreaded moment that no police officer ever wants to face. When Staudenmaier saw her demon and tried to protect herself from it, it gave Steigleder only seconds to protect himself. My heart goes out to both families. We all need to have compassion and understanding for both families. From having been in Steigleder’s shoes, I know his thoughts and feelings. We wish everyone with criticism and advice could have been in our shoes, with our feelings. VAUGHN C. KLIER, Towner County Sheriff Perth, N.D. The death of Joyce Staudenmaier is a tragedy for both her family and the officer who shot her. We will hear the results of inquiries about the shooting, but will there be an investigation into the real cause of her death? In my opinion, her death reflects more the failure of our system of care than the bullet that killed her. Oregon has largely abandoned the mentally ill by not providing adequate resources. Judges do not commit patients who meet the standards expressed in our statutes. Counties defend the limitations in care because of insufficient resources. The Legislature complains about the federal government and the bad economy. Who, then, is going to step forward and stop the premature deaths of people with mental illness? Police shootings catch our attention, but suicide and premature death from medical illness are more costly. It is time for the governor, the Legislature, county and city governments to accept responsibility and correct the tragic state of mental health care. Clackamas County grand jury found Tuesday that a sheriff’s sergeant was justified in fatally shooting a mentally ill woman wielding a knife. The ruling cleared Clackamas County Sgt. Paul Steigleder II, 41, of possible wrongdoing in the Sept. 3 killing of Joyce Staudenmaier. Jacquelyn Staudenmaier, the victim’s sister, declined to comment. The 49-year-old woman was shot in the chest in the lobby of her residence, Chez Ami Apartments, a complex for mentally ill people near Clackamas Town Center. “I am pleased with the findings of the grand jury in this matter,” said Sheriff Pat Detloff, who said his department will conduct its own review. “The investigation we were involved with . . . showed that it was a justifiable shooting and there were no other options open to Sgt. Steigleder other than use of deadly physical force,” he said. Steigleder, who had been placed on paid administrative leave, can return to work as early as today, Detloff said. Joyce Staudenmaier grew up in Lake Oswego and attended a performing arts college in San Diego. She battled schizophrenia for almost three decades. She had been talking to herself and disturbing neighbors in the days before mental health workers called the Clackamas County Sheriff’s Office for help, police had said. Steigleder arrived at the apartment lobby about 10 a.m. and was told that Joyce Staudenmaier was not in the building but could have a weapon. He called for backup. Before backup could arrive, Staudenmaier came to the lobby and lunged at Steigleder with a knife, police said at the time. The sergeant tried to back away but could not escape. He then shot her once in the chest. Meanwhile, Detloff said his agency, in its review, will assess whether there is a need for additional training for officers in dealing with the mentally ill.
A three- to four-member board is expected to convene within 30 days. Detloff said he expected the findings of the review to be made public. The Oregon Advocacy Center, a Portland-based group that works for the rights of the disabled, has requested that the state Office of Investigations and Training review the shooting. Bruce Jenness, OIT acting director, said the office does not investigate police but does review allegations of abuse and neglect of patients in the mental health system. Jenness said it was undetermined whether his office would investigate. A Clackamas County deputy, workers and residents at the Chez Ami Apartments said they feared for one another’s lives in the moments before the deputy shot and killed a mentally ill woman brandishing a knife. One mental health worker locked herself in an office and hid under a desk. One resident who saw the ordeal said she feared the woman would stab the police officer and another worker. The Clackamas County Sheriff’s Office released their statements Thursday, about a month after a Clackamas County grand jury cleared Sgt. Paul Steigleder II of wrongdoing in the shooting of Joyce M. Staudenmaier, 49. The shooting took place the morning of Sept. 3 at the Chez Ami Apartments, a complex near Clackamas Town Center for indigent people with mental illnesses. Staudenmaier, who grew up in Lake Oswego, had been battling schizophrenia for nearly three decades. Friends and residents at the complex said she had been acting strangely months before the shooting. Steigleder arrived at the apartments after Clackamas County Mental Health worker Martha Spiers requested police assistance to place Staudenmaier on a mental hold and bring her to Portland Adventist Medical Center. Staudenmaier returned to the complex as workers were discussing her condition with Steigleder. Spiers tried to explain to Staudenmaier what was happening, but she walked away and tried to return to her room, Steigleder told investigators. Steigleder said he tried to tell Staudenmaier she could not go to her room. She then pulled out a knife. Steigleder said he realized he was in trouble. “And it’s like I’m going to get stabbed. I mean I’m like . . . way too close to her, and I’m like ‘Wow,’ ” he told investigators. As he tried to back away from Staudenmaier, Steigleder found himself backed up against a large glass wall. He said he drew his gun and told Staudenmaier to drop the knife. Staudenmaier swung at Steigleder once and then retreated to another section of the lobby. Steigleder said he feared she would harm other people in the lobby and repeatedly ordered her to drop the knife. Deputy Robert Weinert, who responded immediately after the shooting, found Steigleder bent down beside her saying, “Come on, Joyce, hang in there,” according to police reports. A resident who witnessed the shooting said she saw Steigleder start crying. “I felt sorry for him,” Diane Millican told police. Staudenmaier died in surgery at OHSU Hospital that morning. Steigleder returned to work early this month and has resumed normal duties, said sheriff’s spokesman Joel Manley. The five Clackamas County homicide victims in 2004 include a mentally ill 49-year-old woman and an 82-year-old shot by her husband. In addition, the Clackamas County Sheriff’s Office is investigating the death of a 15-month-old twin as a possible sixth homicide. In 2003, Clackamas County also recorded five homicides. 2004’s tally of homicides started in January when James Orlando Jolley, 79, and his wife, Frances, 82, were found dead in their pink ranch house in the 32000 block of South Ona Way near Molalla. Police think Jolley shot his wife and then himself. Both died of gunshot wounds to the head. The couple had owned the Jolley Rexall Drug Store and another downtown drugstore, the now-defunct Bernie’s Pharmacy. Their deaths shocked the community. On May 3, Arturo Martinez-Navarro, 25, of Clackamas was found shot to death at the Pineview Apartments near the Clackamas Town Center. A second man, Juan Amaro-Benitez, 27, of Clackamas, was injured. A Clackamas County grand jury indicted Richard Aguilar-Hernandez, 22, on charges of murder, attempted aggravated murder and assault. Mexican police arrested Aguilar-Hernandez on June 13. The Clackamas County district attorney’s office is working to extradite him. On July 20, Serapio Arce, 38, of Oregon City died at Legacy Emanuel Hospital & Health Center after being stabbed in the head a day earlier. Police said he and another man had been arguing about Arce’s ex-girlfriend in the 21400 block of Oregon 99E. A Clackamas County grand jury indicted Brian James Chandler, 23, of Milwaukie on accusations of manslaughter and tampering with physical evidence. Chandler’s trial is set for Jan. 18. Police discovered the body of Mohamed Jabbie on Sept. 28 after neighbors at the Clackamas Village Apartments, 8800 S.E. Causey Ave., complained of an odor. Police said the 39-year-old who was found in an apartment, had been shot several times. Clackmas County sheriff’s detectives have named Michael Spencer Washington Jr., 32, as a person of interest in the case. In September, a Clackamas County sergeant fatally shot Joyce M. Staudenmaier, 49, at the Chez Ami apartment complex, which served as home to people with mental illness. Staudenmaier had a history of schizophrenia. Police said Staudenmaier lunged at Sgt. Paul Steigleder II with a knife in the apartment lobby before he shot her. 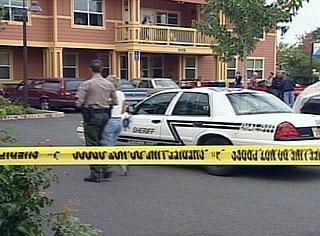 A Clackamas County grand jury decided the shooting was justified. The Clackamas County Sheriff’s Office is investigating the death of 15-month-old Ashton Parris. Paramedics and police arrived Dec. 14 at the boy’s home near the Clackamas Town Center to find the child bleeding from the mouth and not breathing. He was taken to the hospital and died three days later. Police have named no suspects. His death came about a week after another high-profile child abuse case. Gov. Ted Kulongoski has since called for a review focusing on the child-welfare system in the Portland area. When business owners along Southeast McLoughlin Boulevard complained about a man trespassing on their property, the Clackamas County Sheriff’s Office stepped in to help. Normally, deputies would have made an arrest. But in this case, the man was mentally ill and didn’t seem to understand the idea of trespassing. So the deputies tried to think of a way to reach out to him. They learned that the man processed information visually. “He had an incredible memory for things he had seen,” Deputy Angela Brandenburg said. So instead of telling the man that trespassing was wrong, Brandenburg and Deputy Jeff Murray showed him: They gave him a tour of the Clackamas County Jail. The two deputies are part of the newly formed Crisis Intervention Team, a group of Clackamas County law enforcement officers trained to deal with mentally ill people. The program teaches officers how to recognize signs of mental illness and developmental disabilities, and how to best handle those cases. About a third of the calls to the sheriff’s office deal with mentally ill people, said Sgt. Nick Watt, who helped set up the crisis team program. From suicide attempts to disorderly conduct reports to welfare checks, many times, officers are the first to respond. While many such cases are resolved peacefully, the county has its share of high-profile incidents, including the shooting of sheriff’s Sgt. Damon Coates by a mentally ill teenager in 2003 and the fatal police shooting of a mentally ill woman, Joyce Staudenmaier, the following year. Watt and others at the sheriff’s office said the mental health program was not established in response to a particular incident but because of the constant contact officers have with people who are mentally ill. Jail officials have said they’ve seen an increase in mentally ill inmates as health programs that help the mentally ill see their budgets cut. Officers have said they are dealing with more calls related to mental illness. The sheriff’s office has been working on a crisis intervention program for more than a year, and it has been a priority of Sheriff Craig Roberts, who took office in January, Watt said. The Portland Police Bureau and Washington County Sheriff’s Office have similar training. Watt worked closely with Jessica Leitner, a senior program manager at Clackamas County’s Community Mental Health Center, to establish the program. Both Watt and Leitner said the team strengthened the partnership between the sheriff’s office and the mental health center. In February, the sheriff’s office graduated its first team of 12 sheriff’s deputies and 13 officers from Lake Oswego, West Linn, Canby, Gladstone, Milwaukie and Molalla police agencies and county Community Corrections. For one week in February, officers underwent 40 hours of training, mostly from mental health workers, and met with mentally ill individuals who shared their experiences when they were confronted by police. Officers learned to better distinguish whether a person was intoxicated or suffering from hallucinations. The participants also toured sites including the Portland campus of the Oregon State Hospital, the Hooper Memorial Detoxification Center in Portland and the Chez Ami apartments in Clackamas where Staudenmaier was killed. Watt and Leitner said they are working to graduate another Crisis Intervention Team in the fall. They also are working to establish a shorter course to expose more officers to the training. Before this training effort, the Clackamas County Sheriff’s Office last offered a four-hour session about three years ago, Watt said. The trained team members will respond to requests from mental health workers or emergency dispatchers. The sheriff’s office is working on a system to track calls handled by the crisis team, Watt said. But he had no figures on how many calls team members have handled so far. Even though the team is relatively new, it appears that the intervention is working. Since the jail tour, Watt said the sheriff’s office hasn’t heard any complaints about the man along McLoughlin. As Clackamas County sheriff’s deputies file into the community meeting room at Chez Ami Apartments, a 40-unit residence for people with mental illnesses, residents eye them carefully. Two years ago deputies responding to a call of a resident disturbing the peace shot and killed the woman after she charged them with a knife. The residents, a Clackamas County mental health worker has advised the deputies, are still a little on edge. The visit is part of the sheriff’s office’s third semiannual training devoted to teaching officers how to better handle encounters involving people who are mentally ill, who often don’t respond well to traditional police commands and techniques and who might act unpredictably at times of crisis. A woman with ice-blue eyes and bangs pinned back with a sparkly clip asks the deputies why they have to carry guns. Guns, she says, petrify her. She’s seen what police do with them on TV. The police officers assure her they use their guns only in true emergencies –not like the actors on TV. “Do you automatically put us in a box?” she asks. “Do you think mentally ill people have hotter tempers than other people?” asks another. The training –known as Crisis Intervention Training –was held late last month. It is the third since Clackamas County Sheriff Craig Roberts took office in January 2005 and said his office must better equip deputies to deal with the increasing number of calls about people in mental crisis. Roberts said he recognized the need a few years ago as a detective when he responded to the call near Oregon 212 in the Boring area. Roberts showed up to find a suicidal man who’d doused himself with two cans of gasoline and was holding a cigarette lighter. “I thought ‘This is absurd,’ ” said Roberts, realizing he didn’t have training to draw upon. Roberts was able to talk the man into surrendering but felt he was grasping for what to say or do. Jail data show that as many as 28 percent of Clackamas County Jail inmates have a diagnosed mental illness. But officials say the true percentage of inmates who have mental illnesses –diagnosed or not –is probably much higher. Sgt. Nick Watt, who helped developed the crisis intervention course, estimates that 50 percent of the calls he responds to involve someone with mental health issues a suicidal person, a car thief on mind-altering methamphetamine, or a combative person yelling at anyone who passes by. In Clackamas County, there have been several incidents in which police shot and killed people acting irrationally or exhibiting mental problems –including Clint Carey, a 24-year-old Carver man who in 2005 duct-taped a knife to his hand and then charged at deputies; Fouad Kaady, a 27-year-old Gresham man who was reportedly growling, naked and non-compliant to police commands in 2005; and Joyce Staudenmaier, the Chez Ami resident shot in 2004, who had battled schizophrenia for nearly three decades. Clackamas County’s 40-hour class teaches participants about the gamut of mental illnesses and the drugs used to treat them. Participants hear mental health experts’ advice on how police should approach and speak to people with mental disorders. They also act out scenarios they might encounter in the field. Portland, and in more recent years, Washington and Marion counties, also have crisis intervention training. Portland Mayor Tom Potter recently said he wants every patrol officer on the Portland Police force to go through the city’s 40-hour course, which during the past 12 years has been voluntary. And starting in January, the state’s police academy will increase classroom instruction on how to interact with mentally ill people from three hours to 12. Students seeking a basic police officer certification also will undergo eight to 10 hours of scenario-based training. In Clackamas County, 75 members of law enforcement –including about three dozen sheriff’s deputies and three dozen officers from police departments including Lake Oswego, Oregon City, Canby and Sandy –have been through the sheriff’s training. Roberts said his goal is to train all 91 of his patrol deputies in the next few years. So far, he’s about a third of the way there. After a few days of intensive classroom training, the Clackamas County class breaks into small groups to tour apartments and group homes of people with mental illnesses; Portland Adventist’s psychiatric ward, where police often bring people who are threatening to harm themselves or others; and the Hooper detox center in Portland, where police drop off people intoxicated by drugs or alcohol. A Milwaukie group home manager tells visiting officers that it’s a good idea to turn off overhead lights and sirens when responding to incidents at her group home. Lights and sirens can stir bad memories. A woman who suffers from depression tells officers that she doesn’t like handcuffs because they make her feel like a criminal. And a man tells officers that a little bit of leeway goes a long way with him –he still remembers the officer who let him keep his chewing tobacco in his mouth as he was driving to jail. At the Chez Ami Apartments, resident Susan Funk tells the deputies that she’s happy to talk to them about her police encounters because she wants them to see what she’s like 80 percent of the year. “You only know me when I’m freaking out, and that’s why I come to these (trainings),” says Funk, 40, who was diagnosed 17 years ago with bipolar disorder. Funk is clear-headed, witty and pointed in her conversation with deputies. She says if they happen to encounter her on a bad day, they should try to treat her with respect. She doesn’t respond well to harsh commands or force. Funk’s statements about mental health officials, family and friends stepping in before a person with mental illness reaches a state of crisis ring true with Watt, who helped develop the class. Watt, the Clackamas sergeant who helped develop the program, says that clearly many people who need help aren’t getting or seeking the help –and police are the ones called at the last minute when mentally ill people act out in troubling ways. Officers can’t force a mentally ill person to seek treatment unless that person is presenting a safety threat. In those cases, police try to find a hospital placement, but Watt says too often beds at Portland-area hospitals are full. Once, Watt says, the only bed he could find for an emotionally disturbed person was in Roseburg, 175 miles south. What’s more, admittance to a hospital for psychiatric help might only be a short-term fix, because psychiatric staff release the person once the immediate threat has passed. Too often, mental health experts say, people refuse additional treatment. Police and mental health officials attribute the rise in mental health-related calls to a fundamental change in philosophy about how to treat people. People with severe mental illnesses used to be institutionalized, said Jessica Leitner, program manager for the county’s behavioral health division. While training is good, he said, he wants them to know that they won’t always be able to talk a mentally ill person through a crisis. “Screams, terror and a battle” is the account of how a mother and her 8-year-old daughter were able to defend themselves against an unarmed intruder, while the Washington County deputies could not subdue the 5-foot-7-inch man without killing him (The Oregonian, Oct. 25). I believe the story has several glaring problems, including the statement, “The police left the apartment, guns drawn. The man followed.” Say that again? The police excuse for killing 20-year-old Jordan Laird Case is that he was trying to grab a locked rifle in a police car. There is no way to rebut or verify the speculation of the police about what Case was intending when he approached the police car. It seems to me that the police always justify their killings by claiming some threatening action gave them reason to shoot to kill. Yet another life is lost because, I believe, the police do not have the courage to remain calm and professional in the face of erratic behavior by mentally disabled individuals: James Chasse, Lukus Glenn, Fouad Kaady, Jose Mejia Poot, James Jahar Perez, Kendra James, Adam Gantenbein, Joyce Staudenmaier, Thomas Genge, 12-year-old Nathan Thomas and many, many more unnecessary killings. Joyce staudenmeier should have never been murdered. Joyce had a daily routine, and a baby could crawl faster than Joyce could walk. Wilding a knife? Conveniently left out it was a butter knife. Joyce was a kind person who just finished passing out birthday cards to those who had birthdays. The policeman was not in the office as it says but was in the day room. So no the officer was not trapped there are two entrances in and out of that day room. Anyone could have taken Joyce down. Joyce family doesn’t comment because the police are not being truthful. The policeman refused to wait for back up, the policeman refused for anyone to come to Joyce aid after he shot her by the stairs. The policeman refused to listen to the residents. Joyce would never hurt a fly, they are using Joyce mental illness to justify the killing. Police officer was probably crying because he knew he done wrong. So for that policeman to walk just shows the corruption at the highest levels.and to Joyce that is not forgotten, thank you for the birthday card.